Add a pop of red to that little black dress at the office or on the town in this classic Belle-309 sandals - in sizes up to 16! 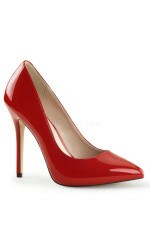 The 3 inch heel is the perfect height for day or evening. The red peep toe vamp sandal has a buckled ankle strap and a slight, 1/8 inch platform. Item Number: PL-BELLE-309RD | Approximate Size (Inches): 8.00 wide x 12.00 deep x 8.00 high | Approximate Shipping Weight: 3.00 lbs.